If you leave continuing education up to each individual, guess what? Employees with the most advanced skills will take them elsewhere, to an MSP that values and supports a culture of continuous learning. They say once you learn to ride a bike you never forget. When it comes to IT, however, our bikes are continually adding new gears, sprouting additional tires and otherwise morphing. For MSPs, the learning never stops. And while most of us understand that training is essential for IT professionals – just witness the hundreds of certification programs out there – many MSP executives incorrectly assume their staffers will seek out training on their own. That’s taking a big chance with your most valuable resource. All types of organizations fall short in providing enough IT staff training, a fact we’ve found after working with government and private-sector companies for years. There are several reasons for this, but they all boil down to not fully understanding what their IT groups do and what training is needed. As a result, they either don’t provide any training or they provide the wrong type. As MSPs know, “information technology” is a catch-all for a vast area of expertise. A typical organization might have IT professionals who work in areas of cybersecurity, business intelligence, data warehousing and desktop support for Windows OS. Each of these areas requires different certifications to ensure optimal IT services. So, for example, requiring all IT staff to take training on Windows OS is a waste of money. A second factor is time. 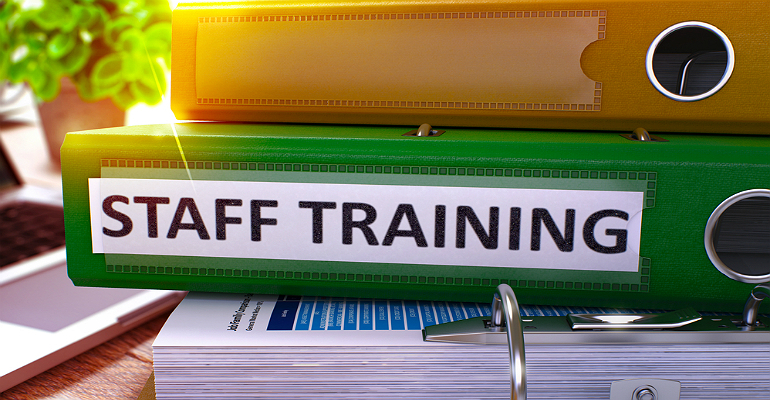 Oftentimes organizations state they encourage and pay for IT training and certifications, but they don’t provide their personnel the time to take the training. Training and certifications are educationally intensive, with hours of coursework and difficult testing scenarios. Far too often, organizations ask their IT staffers to support their customers for 40-plus hours a week and maintain their certifications and stay current on emerging technologies in their field. The speed of technology change is the last factor to consider. Learning can’t stop, because technology doesn’t stop. Having your IT staff stay current is probably the most critical factor for organizations that want to succeed, and thrive, over the next decade. And that goes double for MSPs. So how do you keep staff current while serving customers? There are benefits to both in-house and outsourced training, so we recommend a combined approach. Many MSPs have a wealth of knowledge within current IT staff that can be shared. This can be done via brown bag lunches, webinars and idea meetings. This approach not only supports a culture of learning and cooperation, it helps others to keep up on technologies that they might not use every day and share tips and tricks of which they’re very proud. In-house resources can also be leveraged in a train-the-trainer approach and for on-the-job training. Outsourced training obviously brings outside knowledge, can provide economy of scale and will ease internal training burdens on personnel that may already be over-tasked. It also helps to inject new ideas and topics that are outside of your current base of knowledge and can be instrumental in deciding what new products and services you can offer customers. It’s also where you get the core classes/knowledge for the certifications required by your key suppliers. Whether instruction comes from within or outside, note that different kinds of learning require different kinds of training. E-learning, for example, is great for overviews or as a prerequisite to prepare for more in-depth classroom or on-the-job training sessions. Self-study and vendor instruction builds on e-learning and is a good option when preparing for certification. For more complex and nuanced topics that require hands-on demonstrations, explanations and discussions, in-person training can’t be beat. All too often we find that organizations tell their IT staff to go online, find what they need, take the course and expense it. Oh, and send the certification to HR. While this approach might work for a while, over time people will lose interest in keeping up their skills and take every shortcut to get the documents to HR. IT training is way more important – way more of an operational driver – than such a lax policy justifies. And your most conscientious people will see others cutting corners and wonder why they’re spending their free time on education. It’s a losing strategy. IT is a complex discipline that is constantly changing. If you want to do right by your employees, customers and company, prioritize and personalize IT training. My next article will help you structure an IT training program. I’ll review the different types of outside training available, how to go about hiring trainers and more. Edward Tuorinsky, managing principal of DTS, brings nearly two decades of experience in leadership, management consulting and information technology services. DTS consultants provide full life-cycle management and IT consulting services to support organizations by answering specific questions, solving critical issues or helping plan for the future. For more insights like IT Training 2018, subscribe to the company’s newsletter via DTS’ website and follow them on LinkedIn and Twitter @consultDTS.